At 33 cents each on ebay I think the question is clearly answered, you get what you pay for and in this case $1.75 for a battery that you know is good sounds like a reasonable deal. If the $175 battery last for 18 months you won't need those 10 33 cent batteries, just my opinion. Yeah, but I got Energizer batteries before and they only lasted 4 months, same deal as the dealer Panasonic batteries. Never had mine last more than 6 months. Don't know if it's because I'm in the city and there's lots of other signals/cars around which make them work more than people who may live in a quieter suburb. I use Panasonic batteries. I replace the batteries in the 2 key fobs once a year, and have never had a battery go dead on me. Easy! I search the net and can't find solid answer if the key is on stand by mode when outside the car, or it shuts itself off. Did anyone actually try to see if keyless go would work with dead battery? I still "want" to believe the batteries are only for the remote buttons. So far my keyless go car is garage queen, but 6 months after purchase battery still work. With Mercedes-Benz KEYLESS GO®, you can unlock, lock, start and stop your car or even close your windows and sunroof from the OUTSIDE of your vehicle, simply by having your Smartkey in the immediate vicinity of your Mercedes-Benz. To unlock your car, firmly grip the driver door handle. To unlock all doors, grab any of the passenger handles. Most models have a removable push button located in the ignition and the dash that allows you to insert your Smartkey and use it as a regular car key. If your button is in place, each press is like turning the key one position as long as you don’t press on the brake. With one touch you can turn on your vehicle’s accessories such as the radio. Press the button a second time and the dash lights and all electrical items will turn on. Press a third time with your foot off the brake, and everything turns off. You can also turn all features off by opening your door. To turn the engine on, simply step on the brake and push the START/STOP button. To turn the engine off, stop the car, leave your foot on the brake, and press the START/STOP button once again. Remember to always shift to park and set the parking brake first. If you want to lock your vehicles from the outside, simply touch the sensor located on the door handle. Forgot to close the windows and sunroof? No problem. Keep your finger on the sensor until the windows finish closing. Last edited by kajtek1; 03-02-2019 at 03:34 PM. Did anyone actually try to see if keyless go would work with dead battery? I just tested it. Removed battery from my key. 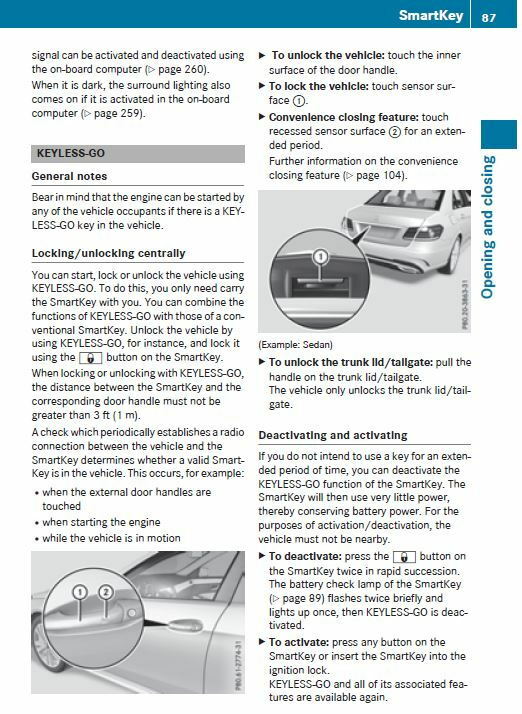 Keyless go stops working completely. Cannot lock/unlock door or start car with push button. Car starts fine if you remove the button and insert key into the hole in the dash. Update... I had my car serviced for other reasons on Monday. While there, I asked my SA about this keyfob battery drainage issue. Both the SA and the Asst. Sve. Manager told me to store my key fob as far away from the car as possible after locking it. "The car is on all the time," they said. "And if the car senses the key fob is within range, it will drain its battery faster." They added, "For sure, do NOT store your key fob in the car, or within the garage where it's parked." Mercedes has offered Keyless Go in their cars for several years now. One would think the dealers have dealt with this question for the same amount of time and know what they are advising to customers. Believe what you want, though. I keep my key fobs in my bedroom, one in a dresser drawer with all the other backup key fobs, and the other on top of the dresser. The dresser is probably 25+ yards from the car in a detached garage. The batteries in my key fobs are OEM to the car, built in July 2015... nearly 4-years ago. Believe what you want, and do what you want, of course. Last edited by DFWdude; 04-17-2019 at 12:21 PM. So the keyless go knob I got with the car is still alive after 6 months and I don't know how old battery was in it. We drive the car like 1-2 times a week, so that has to be a factor? I am on the market for spare key. Anybody know better source than $380 (+ programming) at California dealer? 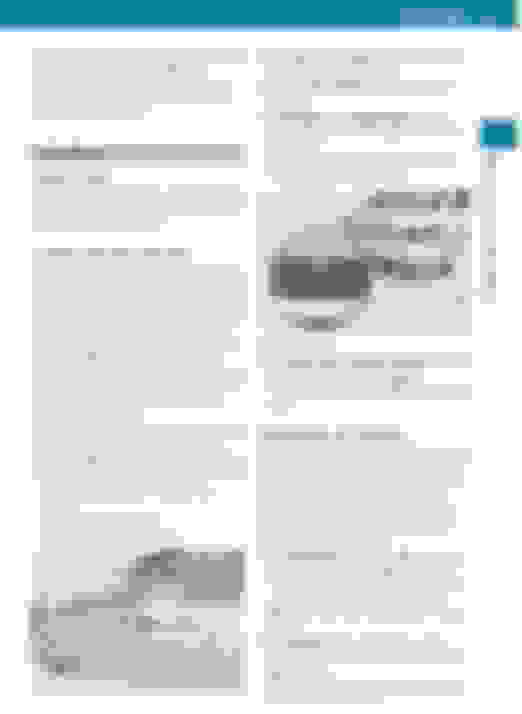 BTW the dispute about putting key far away from car reminds me several topics about Bluetooth in W211 section. Similar if your family room sofa is close to the car, it is the car who is going to answer your cellphone. I had my W211 park next to a camper I slept in and getting up in the morning I noticed Bluetooth puck in the car still active. Good procedure on older cars was to observe cluster and interior lights to go off after 10 seconds from closing the door. Now I need to ask DW to take keyless key (!) away and observe the lights. Last edited by kajtek1; 04-17-2019 at 12:58 PM. I did an experiment a couple years ago. Took my two key fobs, put in fresh batteries from same batch. Locked one in a safe in the bedroom about 50 ft away from the garage, put the other one in the key jar just inside the house about 15 feet from the car. Both fobs gave me the low battery message about 6 months later. So as far as distance away from car, that doesn't seem to make any difference in terms of battery drain. Both the SA and the Asst. Sve. Manager told me to store my key fob as far away from the car as possible after locking it. Check manual for my 2014 model and no such option. Will play with key later to see if that might still work. Check manual for my 2014 model and no such option. Replied toDFWdude dealer's comments, couldn't be more clear. Last edited by konigstiger; 04-17-2019 at 04:44 PM. Konigstiger, I forgot about the ability to de-activate key fobs. I have now done so with my backup fob in the dresser drawer. Thanks. Sorry to distract with my previous. Let's return to the topic. You might be able to find lithium CR2025 batteries at Dollar Tree. They used to come as a 2-pack, which comes out to only 50 cents a battery, but they might be switching to single packs. The brand is Sunbeam. It's what I've used the past several years.